This study investigates whether a higher temporal and spatial resolution of precipitation could provide an improvement in model performance. Results show that: a higher temporal resolution of rainfall improved the model performance if the observation density was high; a combination of observed high temporal-resolution observations with disaggregated daily rainfall leads to a further improvement; for the present work, the increase of spatial resolution improved the model insubstantially. This paper explores the simultaneous calibration method to transfer model parameters from gauged to ungauged catchments. It is hypothesized that the model parameters can be separated into two categories: one reflecting the dynamic behavior and the other representing the long-term water balance. The results of three numerical experiments indicate that a good parameter transfer to ungauged catchments can be achieved through simultaneous calibration of models for a number of catchments. This paper is aims to detect the climate change impacts on the hydrological regime from the long-term discharge records. A new method for stochastic analysis using copulas, which has the advantage of scrutinizing the data independent of marginal, is suggested in this paper. Two measures are used in the copula domain: one focuses on the asymmetric characteristic of data and the other compares the distances between the copulas. These are calculated for 100 years of daily discharges and the results are discussed. Due to the lack of long-term observations, insights into changes of groundwater resources are obscured. In this paper we assess past and potential future changes in groundwater drought in headwater catchments using a baseflow approach. There are a few past trends which are highly dependent on the period of analysis. Catchments with short response times are found to have a higher sensitivity to projected seasonal precipitation shifts, urging for a local management based on response times. Topography plays an important role in determining the spatial heterogeneity of ecological, geomorphological, and hydrological processes. Topography plays a more dominant role in low flows than high flows. Our analysis also identified five significant TIs: perimeter, slope length factor, surface area, openness, and terrain characterization index. These can be used to compare watersheds when low flow assessments are conducted, specifically in snow-dominated regions. The GRANADA open-access database (NGU, 2016a) was used to derive point recordings of thickness of sediment above the bedrock D(u). For each D(u) the horizontal distance to nearest outcrop L(u) was derived from geological maps. The purpose was to utilize L(u) as a secondary function for estimation of D(u). Two estimation methods were employed: ordinary kriging (OK) and co-kriging (CK). A cross-validation analysis was performed to evaluate the additional information in the secondary function L(u). The notion of a measure to quantify the degree of heterogeneity of a region from which information is required to estimate the magnitude of events at ungauged sites is introduced. These heterogeneity measures are needed to compare regions, evaluate the impact of particular sites, and rank the performance of delineating methods. A framework to define and assess their desirable properties is proposed. Several heterogeneity measures are presented and/or developed to be assessed, giving guidelines. Oceanic–atmospheric climate modes, such as El Niño–Southern Oscillation (ENSO), are known to affect the streamflow regime in many rivers around the world. A new method is presented for ENSO conditioning of the ensemble streamflow prediction (ESP) method, which is often used for seasonal streamflow forecasting. The method was tested on three tributaries of the Columbia River, OR. Results show an improvement in forecast skill compared to the standard ESP. The potential of geostatistical tools, leveraging the spatial structure and dependency of correlated time series, for the prediction of daily streamflow time series at unmonitored locations is explored. Simple geostatistical tools improve on traditional estimates of daily streamflow. 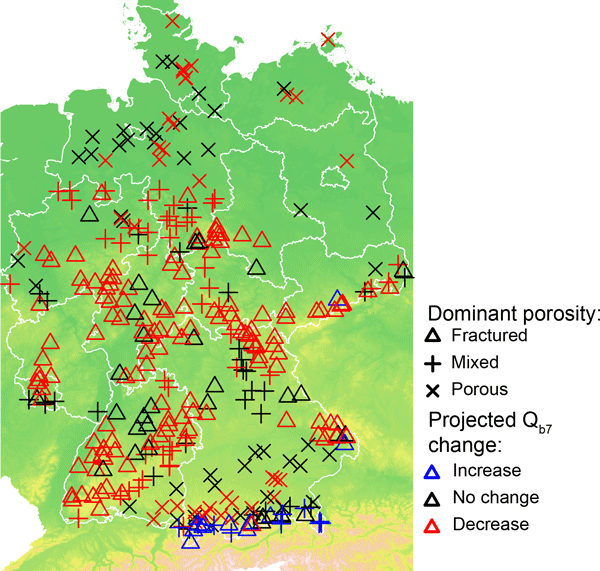 The temporal evolution of spatial structure, including seasonal fluctuations, is also explored. The proposed method is contrasted with more advanced geostatistical methods and shown to be comparable. The region of West Africa is undergoing important climate and environmental changes affecting the magnitude and occurrence of floods. This study aims to analyze the evolution of flood hazard in the region and to find links between flood hazards pattern and rainfall or vegetation index patterns. Is bias correction of regional climate model (RCM) simulations possible for non-stationary conditions? 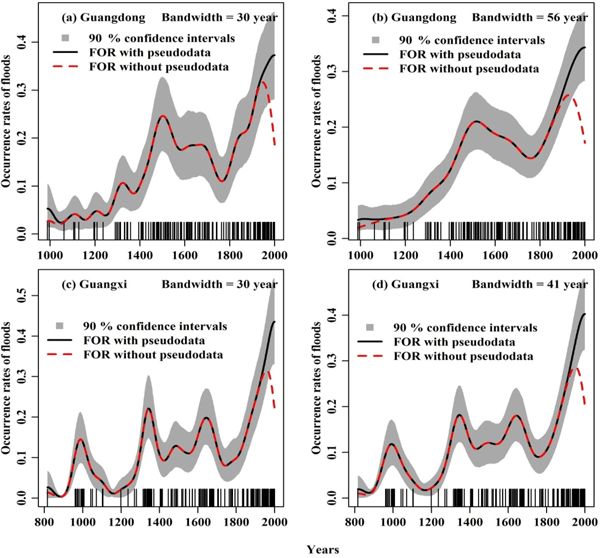 Topological and canonical kriging for design flood prediction in ungauged catchments: an improvement over a traditional regional regression approach? Contrasting trends in floods for two sub-arctic catchments in northern Sweden – does glacier presence matter?